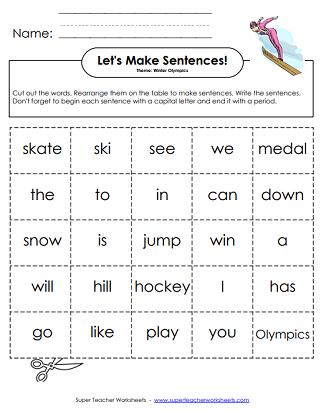 These printable worksheets can be used to enhance your unit on the Summer or Winter Olympic Games. 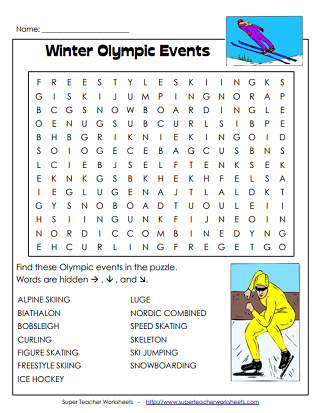 How many Winter Olympic events can you find hidden in the puzzle? Word list includes biathalon, freestyle skiing, bobsleigh, luge, and figure skating. Find the Summer Olympic events hidden in this word search puzzle. Words include tennis, basketball, diving, swimming, and triathlon. Cut out the letters in the words "Winter Olympics" and rearrange them to make as many words as possible. This version has primary-ruled lines and is designed for students in Kindergarten through 2nd grade. Cut out the letters in the words "Winter Olympics" and rearrange them to make as many words as possible. This version has intermediate-ruled lines and a more advanced scoring system, created for students in 3rd through 6th grades. Cut out the letters in the words "Summer Olympics" and rearrange them to make as many words as possible. This version has primary-ruled lines and is designed for students in Kindergarten through 2nd grade. Cut out the letters in the words "Summer Olympics" and rearrange them to make as many words as possible. This version has intermediate-ruled lines and a more advanced scoring system, created for students in 3rd through 6th grades. Corrine loves Mrs. Roger's gymnastics unit at school, but when she goes to gym class and finds out they are watching a video about the Olympics, she's very disappointed. However, she becomes inspired by the gymnasts on the video and she decides to sign up for the school's Summer Gymnastics Camp. Anna is practicing her yo-yo for the future Olympics. The only problem is: she can't find where her yo-yo, or her kitty, went! This reading comprehension includes comprehension questions, a writing prompt, and vocabulary words. Cut out 25 word cards. Students rearrange them on their desks to make as many complete sentences as possible. Word cards include basic sight words, such as play, is, we, see, go, to, and can. Other cards have words with a Winter sports theme, such as medal, ski, hockey, skate, snow, and win. Cut out the words and rearrange them into a sentence. The sentence reads, "I watch the Winter Olympics!" Cut out the words and rearrange them into a sentence. The sentence reads, "I watch the Summer Olympics!" Keep track the medal winners for each event in the Winter Olympics. Students can write the winning athletes' names or countries on the chart. This poem captures the excitement of the opening ceremony of the Olympics. This poem describes a figure skater trying to win a gold medal. Written from a soccer ball's point-of-view, this poem tells what it feels like to be batted and kicked around a field. This file includes comprehension questions and a writing activity. We have worksheets for almost every holiday throughout the school year. 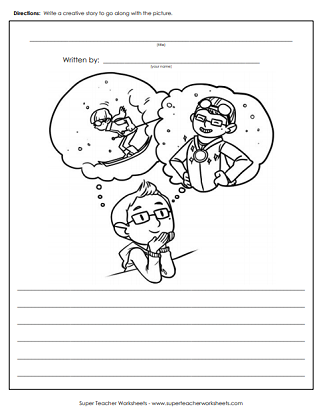 Browse our complete selection of holiday worksheets.